One of the few devices in the United States based on embryonic stem cell technology has recently moved into clinical trials. Viacyte, a startup company in San Diego, has used its tissue engineered pancreatic replacement technology to reverse diabetes in animals, an advance that is now being tested in human clinical trials. A successful trial could lead to relief for many millions of people suffering from diabetes. Several research teams are focusing on the development of a so-called artificial pancreas, basically a device that automates blood glucose testing and administers insulin as needed to maintain proper blood glucose levels. 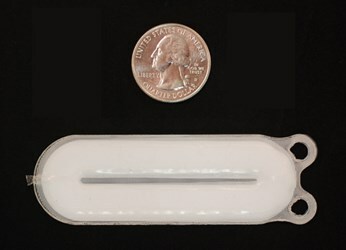 This technology would represent a significant advance over current blood sugar management methods, but a tissue-engineered solution would allow diabetic patients to essentially lead normal lives. Using embryonic stem cells to create a tissue engineered organ is the focus of Viacyte, according to a recent story from the MIT Technology Review. Using stem cell filled pouches, the company recently began clinical trials in human patients, after spending over a decade mostly focused on getting the stem cells to mature in culture to a point where they could act as pancreatic islet cells in the body. Data released by the company to gain regulatory approval for the trial shows the pancreas-in-a-capsule technology released insulin and glucagon while controlling blood glucose in mice. To get the cells to begin acting as pancreatic islet cells — the cells that normally release insulin in the body — the team has relied on the patient’s body to complete the differentiation after they have been implanted. While this approach showed signs of success in mice, it is yet to be seen if it will work in humans. Avoiding the body’s natural immune response is another significant challenge to this approach. The team’s design uses a permeable mesh to overcome this, according to the MIT Technology Review story. While openings allow communication between the body and the cells inside the mesh, the pores are too small for immune cells to penetrate, thus protecting the cells inside. There is concern, however, that the body will simply encapsulate the device, closing it off in a soft tissue layer, as has been the case with some implants previously. Though challenges for implementing this technology still exist, the arrival of stem cell based therapies at the clinical trial level is a significant step forward in the space. Clinical trials are also underway for artificial pancreas devices, and Medtronic recently announced progress in the development its own system. An initiative is also underway to produce a pediatric artificial pancreas.